The focus in version 1.8 is DeNoise which has received several quality improvements. A new soft knee parameter allows for more natural transitions between noise and the wanted signal. 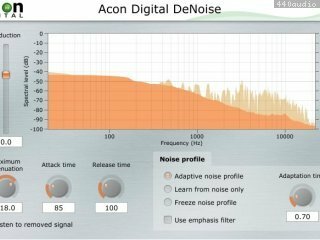 It is in most situations desirable to leave a certain noise floor in the restored signal and it is easier to achieve a natural sounding residual noise with the new update. DeNoise has been improved for even more transparency and less processing artifacts. 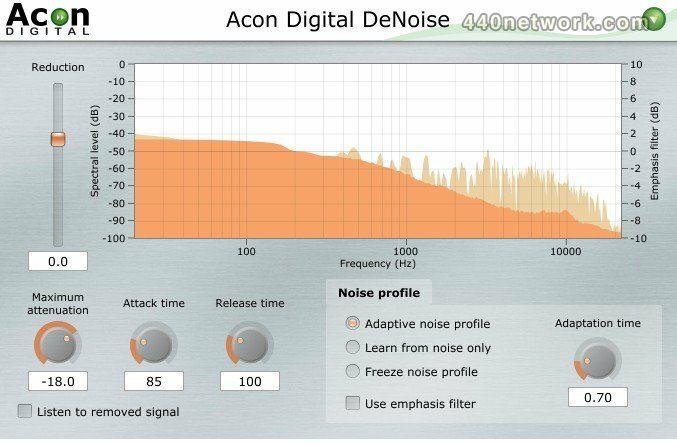 DeNoise now reduces broadband noise even more effectively. The center frequency, bandwidth and filter slope of the current band is displayed as cursor information when modifying filter band settings in the emphasis filter editor. DeHum can now process up to 96 harmonics and passes the Audio Unit validation on OS X Mavericks (v10.9). DeClip contains audio quality improvements and is better at reconstructing high frequency content. The plug-ins now show up as stereo plug-ins in Reaper when using Audio Units on OS X.
DeHum now resets its internal state properly so that previous audio data don’t affect the output when the same instance of the plug-in is used for other audio material. The parameter settings were not recalled when opening a project in Ableton Live containing any of the Restoration Suite plug-ins. Acon Digital DeClip did not update the handle bars in the histogram when recalling presets or using automation. Freeze in WaveLab 6 when the demo mode window was shown. The drop-outs in the demo mode are now synchronized to make it easier to evaluate the quality when chaining the plug-ins. When launching the help from the German user interface, the English help was opened.